Cinnamon season has definitively arrived, so I thought I’d come up with a cinnamon version of my popular no-bake chocolate coconut cookies. Without the chocolate, obviously. 🙂 These no-bake cinnamon coconut cookies are dense, chewy, and bursting with cinnamon flavor. 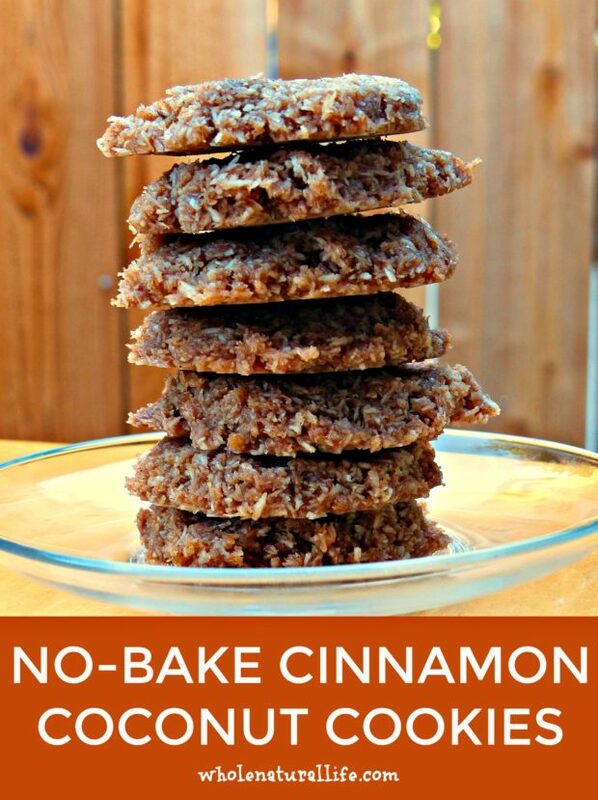 I love that these cookies are naturally gluten-free, grain-free and egg-free. (Plus a bunch of other allergens like dairy and nuts.) They’re also really easy to make: just melt your oil, dump in all other ingredients, mix and then freeze. That’s my kind of recipe–delicious but not much work! If you enjoy making recipes with shredded coconut, I highly recommend buying your shredded coconut online. In my experience, buying it in bulk is WAY less expensive than buying small packages at the grocery store. (If your local store has a great bulk section, that may be an affordable option, too.) I usually buy this shredded coconut. I also like using it in these coconut butter cookies and my chocolate coconut butter bites. These cookies keep really well in the freezer, so I usually double this recipe when I make it. Add coconut oil to a saucepan and heat until the coconut oil is just melted. Add shredded coconut, honey, cinnamon, vanilla and salt. Mix until all ingredients are thoroughly combined. Line a cutting board (or other flat surface that can fit in your freezer) with parchment paper. Use a large spoon to scoop a spoonful of mixtue onto the parchment paper. Use your fingers to gently flatten and compress the dough so it forms a cookie. Repeat for all of the remaining dough. Transfer cutting board to your freezer and freeze until cookies are solid. Once frozen, store cookies in a lidded container in your fridge or freezer. If necessary, repeat process with any remaining dough. Looking for More Gluten-free Cookie Recipes? Be sure to check out my other gluten-free cookie recipes, like no-bake chocolate coconut cookies, cashew butter chocolate chip cookies, and flourless chocolate coconut butter cookies. If you found this recipe because you’re a coconut lover, I think you’ll also enjoy my other coconut-rich recipes, like coconut berry delights, lemon coconut delights, homemade mint chocolates, coconut oil fudge and coconut oil mints. My Coconut E-Book is Here! !